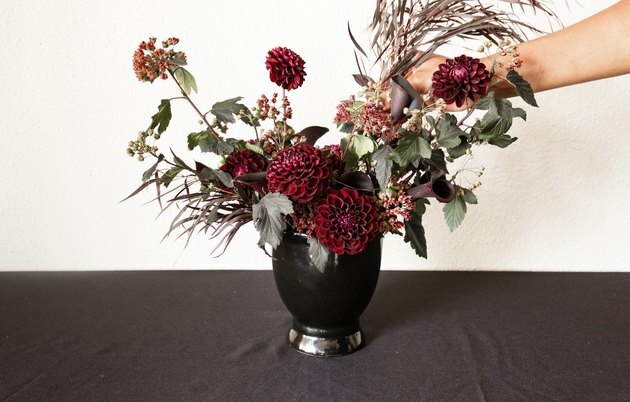 This gorgeous, rich-hued floral arrangement is the type of fall decor that the adult in you is begging for. 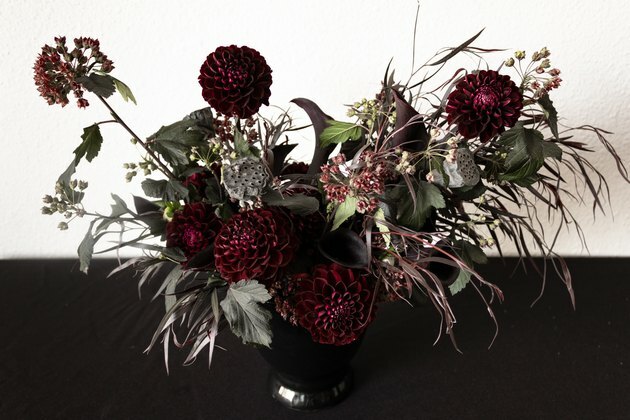 It's perfect as a table centerpiece during a sophisticated Halloween soiree or as autumnal entryway decoration. 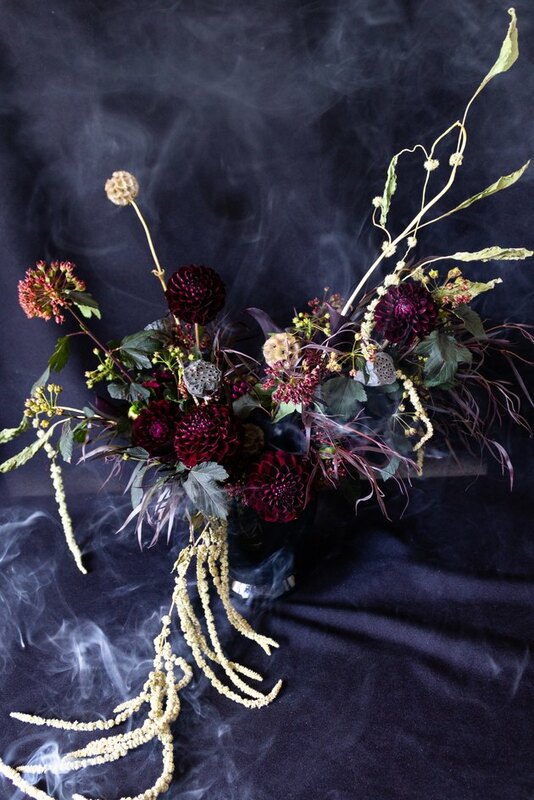 With blooms in deep, Gothic shades; foliage loaded with texture; and dried elements picked straight from the front yard of an abandoned Old Hollywood mansion (or at least appear that way! 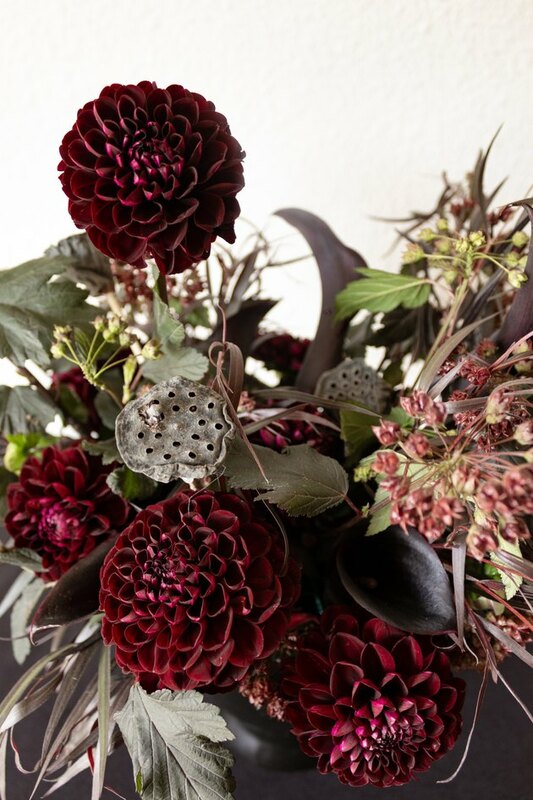 ), these blooms make a beautifully bewitching statement that's perfect for the season. Cut a piece of chicken wire (a little smaller than a piece of paper) and loosely gather it into a ball. Keeping it loose will make it easier to add stems as you build your arrangement. Push into your vase and fill it with cold water. TIP: Chicken wire is a great environmentally-friendly (and reusable!) alternative to floral foam. 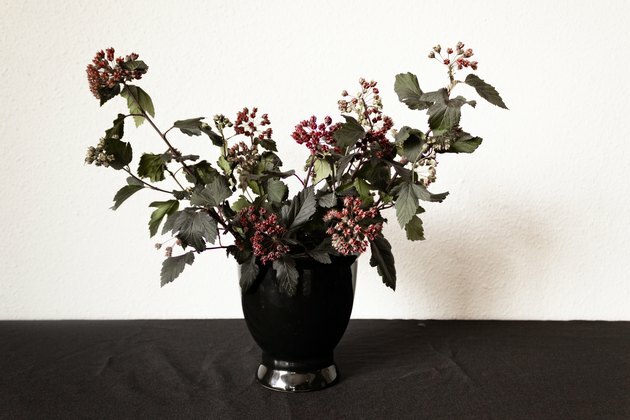 Create the basic shape of your arrangement with your viburnum foliage. Place along the edge of the vase, as well as longer pieces on the sides. 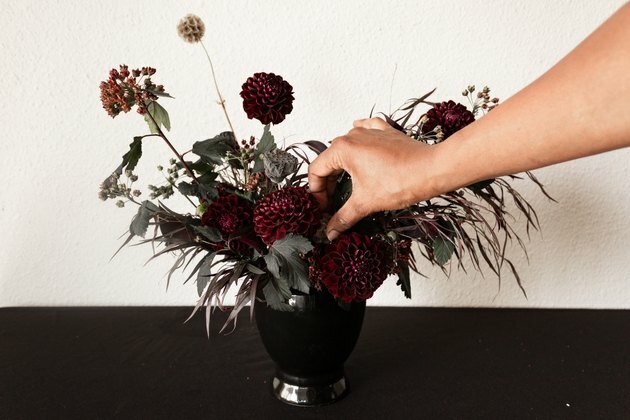 Add half of your dahlias to the vase. Add the calla lilies throughout the arrangement. We love to have these mostly sunken in the center with a couple of stems kept long. If your calla lilies stems are all curved, you can straighten a couple by lightly squeezing and pulling down on the stem from the top. 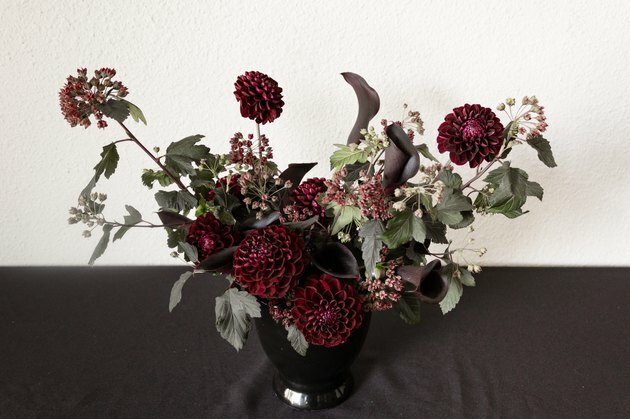 For added texture, take a couple of stems of agonis and place them in your arrangement. Their feathery leaves add great texture without making your arrangement bulky. Finally, add your dried ingredients to give it that look of decay. 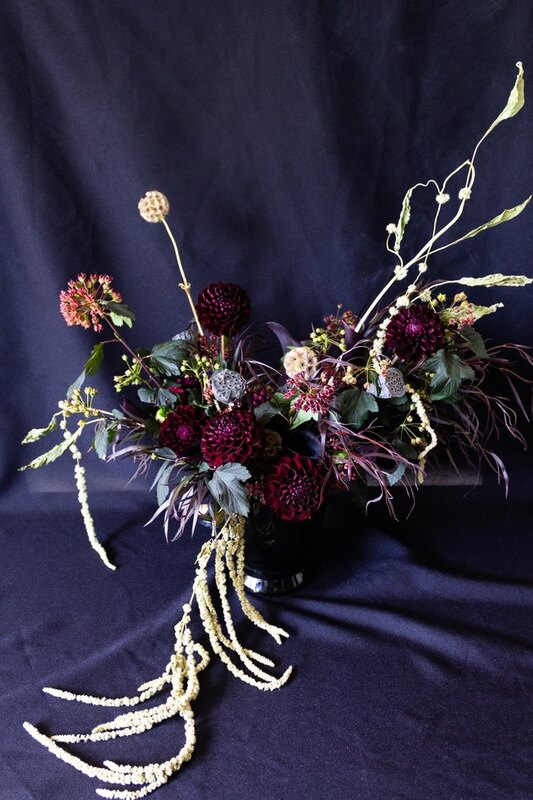 We selected dried mini lotus pods (these look particularly buggy), dried scabiosa pods, and dried green amaranth. 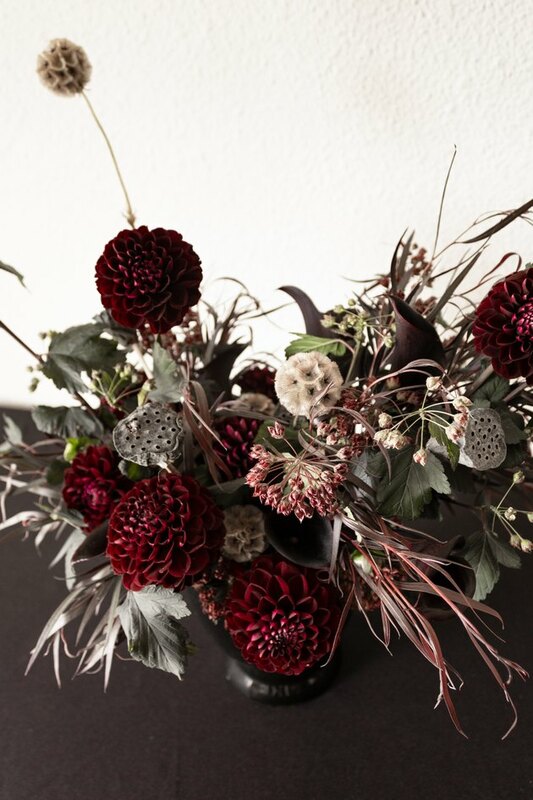 Adding elements in clusters, such as the scabiosa pods, allows smaller elements to have more impact. For the amaranth, add this to the sides of the arrangement for dramatic effect. 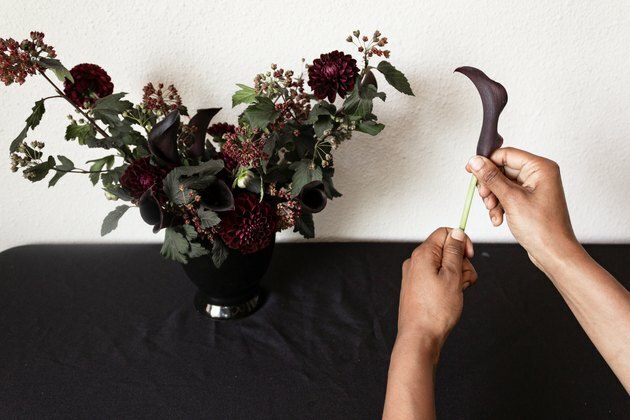 TIP: When creating an arrangement, create depth by burying some stems into the center, so that you only see a portion of it. This creates more visual interest. 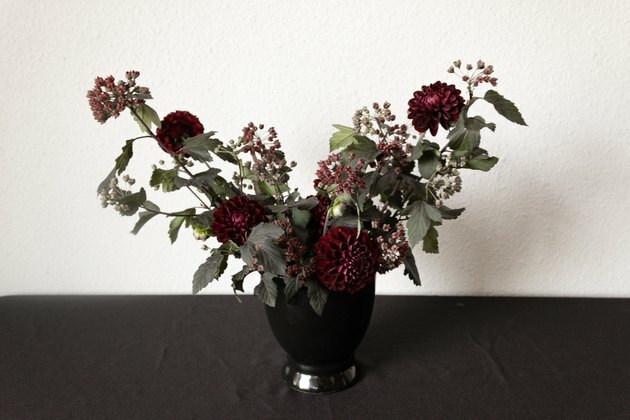 Top off your arrangement with a little extra cold water (cut flowers tend to drink up water quickly). Now your table, bar, or entryway is ready for Instagram-worthy seasonal decor.